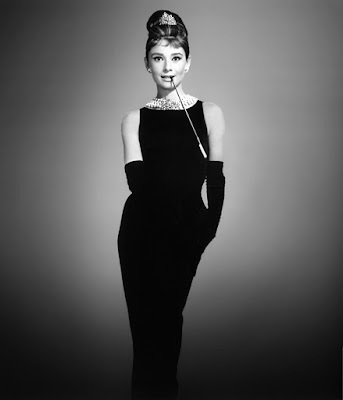 Breakfast at Tiffany's (1961), starring Audrey Hepburn, is one of the old Hollywood favorites airing on TCM this week. This week, TCM is airing great movies from stars like Audrey Hepburn, Bette Davis, and Mary Astor. Plus, they are featuring films about siblings and old Hollywood's European emigres. So, without further ado, let's jump right in to this week's offerings. Just a note: the highlighted text has links to full length articles. Birthday tributes: Mary Astor on Tuesday; Audrey Hepburn on Wednessday. Sunday Prime Time: A Mother's Day celebration. 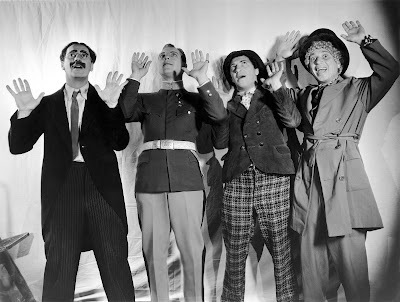 Silent Sunday Nights: Mockery (1927) at 12:30 a.m.. This drama about the Russian Revolution stars Lon Chaney as a peasant who comes to the aid of a countess (Barbara Bedford). TCM Imports: Director Michelangelo Antonini's avant-garde film, L'Avventura (1960) at 2 a.m. Sunday night/Monday morning. Best Day to DVR: Wednesday daytime, which features several of Audrey Hepburn's best films. This is a great week for . . .: Spencer Tracy fans. Three of his best films are airing in prime time on Tuesday, Wednesday and Friday. 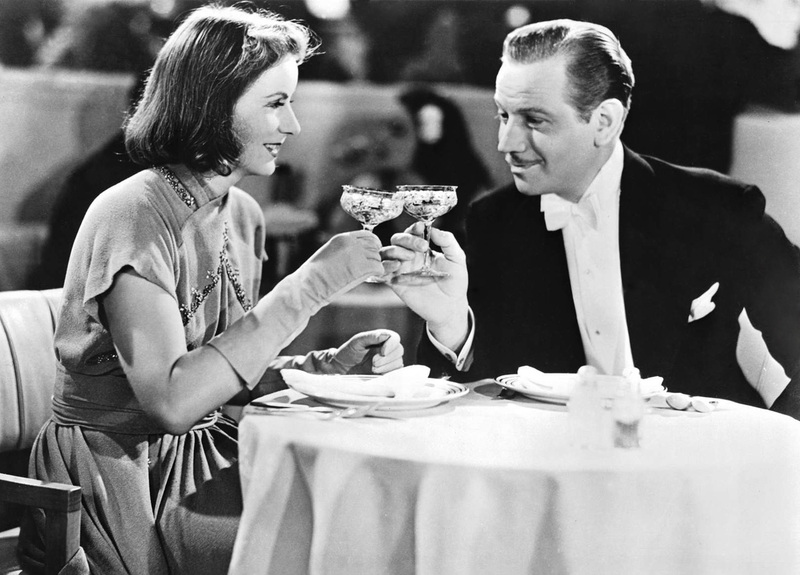 Greta Garbo and Melvyn Douglas in Ninotchka (1939). Daytime Theme: Movies about siblings. Four Daughters (1938) at 6 a.m. stars John Garfield as a brooding musician who gets involved with a family of musical prodigies played by the Lane Sisters. Howard Keel is the head of a love-starved pioneer clan who are looking for some "Sobbin' Women" in the classic musical Seven Brides for Seven Brothers (1954) at 2:15 p.m. Little Women (1933) at 4 p.m. follows the triumphs and trials of the March sisters in Civil War-era Massachusetts. Primetime theme: TCM is hosting a three-day festival of films from old Hollywood's European emigres. First up is the documentary Cinema's Exiles: From Hitler to Hollywood (2009), which examines the impact of emigres from the German film industry on American cinema. Casablanca (1942) at 10:15 p.m. was directed by Hungarian immigrant Michael Curtiz and starred European film veterans like Ingrid Bergman, Peter Lorre, S.Z. Sakall, and Paul Heinreid. Late Night Pick: German immigrant Ernst Lubitsch was known for his sparkling romantic comedies like Ninotchka (1939) at 2 a.m. starring Swedish actress Greta Garbo. Daytime Theme: A birthday tribute to Mary Astor who was born Lucile Langhanke on May 3, 1906, in Quincy, Ill. Astor started out in silent films, and she became one of the great stars in pre-code Hollywood. Astor's career faltered a bit in the mid-thirties, but she made a sensational comeback in 1941 when she played femme fatale Brigid O'Shaughnessy in The Maltese Falcon (1941). TCM is focusing on Astor's silent and pre-code films starting with the silent costume drama Beau Brummel (1924) at 7 a.m. where she appears opposite her off-screen love John Barrymore. Other Men's Women (1931) at 12:15 p.m. stars Astor as a woman who comes between two railroad engineers (Grant Withers and Regis Toomey). This movie is notable for supporting performances from James Cagney and Joan Blondell. The Sin Ship (1931) at 2:45 p.m. is a turgid soaper about a female passenger (Astor) who is menaced by a ship's crew. Primetime Lineup: TCM continues its second night of the Cinema's Exiles series with Music in the Air (1934), a pre-code musical that has contributions from several emigres including director Joe May, screenwriter Billy Wilder, and producer Erich Pommer. Fury (1936) at 9:45 p.m. is the first American film from pioneering German director Fritz Lang. It stars Spencer Tracy as an innocent man who seeks revenge on a lynch mob. 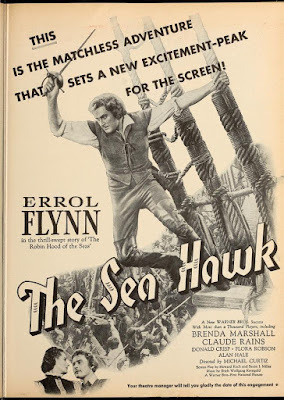 Late Night Pick: The Sea Hawk (1940) at 5 a.m. is a great Errol Flynn swashbuckler with German Expressionist style cinematography from director Michael Curtiz and cinematographer Sol Polito. Daytime Theme: A birthday tribute to Audrey Hepburn who was born Audrey Hepburn-Ruston on May 4, 1929, in Ixelles, Belgium. After appearing in a few small roles in British movies, Hepburn became an overnight star and fashion icon in Roman Holiday (1953). TCM is airing some of Hepburns best films including her Academy Award-nominated performance as a dedicated nurse who begins to question her Catholic faith in The Nun's Story (1959) at 7:15 a.m. 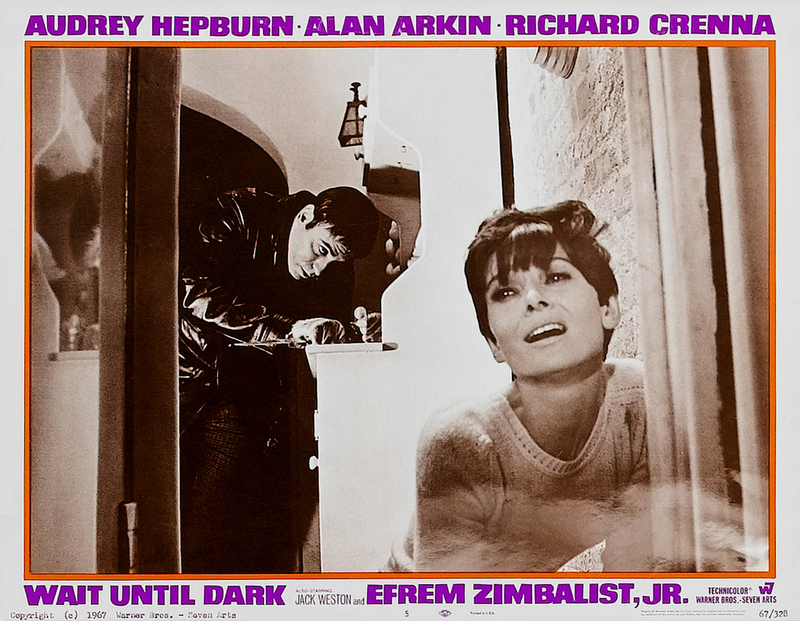 The thriller Wait Until Dark (1967) at 2 p.m. stars Hepburn as a blind woman who is menaced by drug smugglers. The all-time classic Breakfast at Tiffany's (1961) at 6 p.m. features Hepburn's iconic performance as Manhattan party girl Holly Golightly. Primetime Lineup: TCM wraps up its Cinema's Exiles festival with The Seventh Cross (1944) at 8 p.m. This film directed by Austrian immigrant Fred Zinneman was one of the first movies to deal directly with the Holocaust. The Killers (1946) at 10 p.m., starring Burt Lancaster and Ava Gardner, was directed by German-born noir master Robert Siodmak. Late Night Pick: Director Alfred Hitchcock's second American film, Foreign Correspondent (1940) at 2 a.m., deals with the rise of fascism in Europe. Daytime theme: Movies from classic comedy teams. Bud and Lou battle pirate Charles Laughton for buried treasure in Abbott and Costello Meet Captain Kidd (1952) at 7:45 a.m. while the Marx Brothers bring chaos to the world of high art in A Night at the Opera (1935) at 1 p.m. Blotto (1930) at 2:45 p.m. is a hilarious short that finds Laurel and Hardy getting into some powerful booze. Primetime lineup: TCM will celebrate the legendary B movie company American International Pictures with a spotlight on the company's films every Thursday in May. Appropriately, the festival starts out with AIP's first film, The Fast and the Furious (1954) at 8 p.m., which is a car chase thriller about a young couple (John Ireland and Dorothy Malone) on the run from the law. The science fiction flick, The Beast With a Million Eyes (1955) at 9:30 p.m., about a mind-controlling alien that terrorizes a desert town is typical of many of AIP's fifties releases. Late Night Pick: In the 1950's, AIP catered heavily to a teenage audience with films like High School Hellcats (1958) at 12:15 a.m., which is a Mean Girls-type movie about an all-female high school gang. Robert Ryan and Merle Oberon in Berlin Express (1948). Daytime theme: Movies about May. Seven Days in May (1964) at 6:30 a.m. is a taut thriller from The Manchurian Candidate (1962) director John Frankenheimer about a coup planned by the U.S. military. Maytime (1937) at 8:45 a.m. is the best of the Jeanette MacDonald and Nelson Eddy's musicals featuring a beautifully filmed May Day scene where the couple belt out the classic romantic number, "Sweethearts," amid a shower of spring blooms. 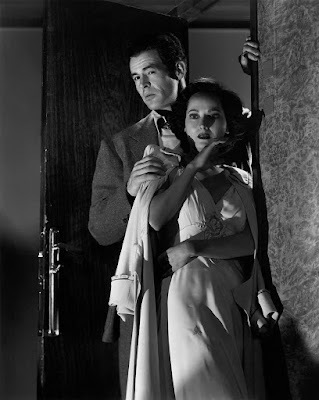 Berlin Express (1948) at 4:45 p.m. isn't about May, but it is an underrated drama about a Nazis in postwar Germany that stars Robert Ryan and Merle Oberon. Primetime lineup: Ryan is TCM's May star of the month. The channel will air his films each Friday in May. Ryan was a stalwart leading man, who is known for his performances in films noir and war movies, but he excelled in several genres, including costume dramas and romances. TCM is kicking off Ryan's celebration with one of his best-known films, Bad Day at Black Rock (1955) at 8 p.m., which features Ryan and Spencer Tracy facing off over the fate of a Japanese-American war hero. Crossfire (1947) at 9:30 p.m. features Ryan in a riveting Oscar-nominated performance as a vicious white supremacist who is accused of murdering a Jewish man (Sam Levene). Late Night Pick: The Set-Up (1945) at 4 a,m. is a fine noir starring Ryan about an aging boxer's last chance to prove himself in the ring. TCM's prime time lineup is all about Bette Davis in the 1950's. The night begins with her comeback performance in All About Eve (1950) at 8 p.m. followed by the family drama, A Catered Affair (1956) at 10 p.m. The night winds up with the mystery Another Man's Poison (1951) at 12:15 a.m., which features Davis as a mystery writer who gets involved in some real-life intrigue. The Sunday Night Feature is a celebration of Mother's Day. First up is the classic seventies drama Sounder (1972) at 8 p.m., which stars Cicely Tyson as the mother of a family of Southern sharecroppers who are struggling through the Great Depression. Next is I Remember Mama (1948) at 10 p.m., which features Irene Dunne as the matriarch of a Norwegian immigrant family.